Reese Witherspoon’s Engagement Ring – Dazzling! Reese Witherspoon’s engagement ring, featuring a gorgeous 4-carat Ashoka diamond simply set on a platinum band embellished with pave diamonds, is an elegant piece with a timeless feel. The couple began dating in January of 2009 and announced their engagement in December of 2010. Not only did Reese and Jim express their happiness with their relationship, Jim bonded easily with Reese’s children, Deacon and Ava, who she shares with prior husband Ryan Phillippe. Reese and Jim were married in Ojai, California, in March of 2011. The family has continued enjoying life since then, and we wish this lovely Hollywood couple many wonderful years together. Like Reese Witherspoon’s engagement ring, this stunning example from Brilliance features a spectacular diamond showcased by pave diamonds along the ring’s shanks. This simple setting isn’t overdone; much like Grace Kelly’s famous Cartier engagement ring, it allows the center stone to take the spotlight. Born March 22, 1976, Reese Witherspoon landed her first feature role in the 1991 film The Man in the Moon. She gained greater popularity for roles in Freeway and Pleasantville, but her real breakthrough came with her appearance as Elle Woods in the 2001 hit Legally Blonde. Her 2005 portrayal of June Cash in Walk the Line earned her a Golden Globe, and Academy Award, and numerous other awards. Reese married actor Ryan Phillippe in 1999. The couple separated in 2006 and divorced in 2007. She later dated her Rendition co-star, Jake Gyllenhall; they broke off their relationship in 2009. Reese has two children from her marriage with Phillippe, and she and husband Jim have a son, Tennessee James Toth, who was born in 2012. Did you know that Reese Witherspoon has a long philanthropic history? She has supported Save the Children for many years, and was on the board of the Children’s Defense Fund. She was also among a group of actresses who traveled to New Orleans after Hurricane Katrina. Reese is the honorary chair of the Avon Foundation, which is a charitable organization that focuses on important women’s issues. What Our Experts Have to Say about Reese Witherspoon’s Engagement Ring. Reese Witherspoon’s engagement ring features a rare Ashoka diamond, which features rounded corners and 62 displayed facets. Only about ten percent of the rough diamonds mined each year have the ability to withstand the rigors of the Ashoka cut, making this particular ring a rare and valuable one. 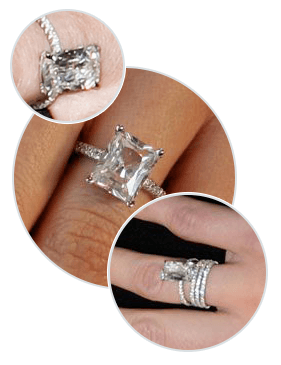 Like many celebrity engagement rings, this one is breathtakingly priced at over $150,000. Celebrity engagement rings like the one Reese Witherspoon received from Jim Toth often come with price tags in the six to seven figure range. Most of us have smaller budgets, but that doesn’t mean you can’t enjoy wearing a stunning ring modeled after Reese Witherspoon’s. By choosing Brilliance, where our diamond experts help you to design the celebrity engagement ring of your dreams, you can satisfy your taste as well as your budget, creating a unique engagement ring that celebrates the love you share.